A weekend in London for £100? Yeah right. OK, so you’re not going to sleep between Egyptian cotton sheets, sip champagne, or shop till you drop, but a weekend in town for less than £100 is possible — I promise. It just takes a little planning, some effort, and a whole lot of self-control. Here are some insider tips that can make London work for you. The Ritz is out, but there are a handful of decent, central hostels in London. Being fairly central is important as it saves you valuable travel pennies. Piccadilly Backpackers Hotel has 10 bed dorms at £15.50. Also check out the Holland Park YHA (£16.50) and St Pancras YHA (£24.50). All prices are per person per night and include breakfast. £££ Tip: Bring your own sleeping bag and you won’t have to pay extra to hire sheets. Travel is a big expense in London — just a few stops on the tube can cost £4. But London has an amazing network of buses, many running 24 hours. Pick up an oyster card (£3 refundable) when you arrive and charge £10 to it. Since a single journey costs 90p (100p/£1) this will cover eleven bus journeys. It’s not always easy to work out bus routes, but check maps at the bus stops and if you are still stuck, ask. Most Londoners are happy to help despite their unfriendly reputation. ££££ Tip: Walking around town is a fantastic way to experience London and things are closer than you think — most bus stops have a local map with road names if you get lost. You can spend a fortune on food in London, and many visit the capital to do just that, but with some careful thought you can find great value food. For lunch, a take-away sandwich or carton of soup are not exciting but they will fill you up. 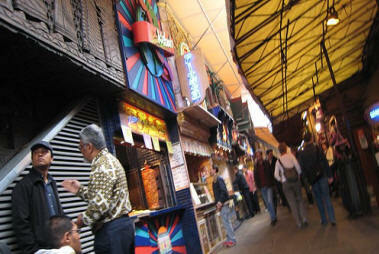 Or find a street market with food stalls such as Whitecross or Portobello for a Pad Thai or Bean Burrittos. The trick is finding somewhere to eat your lunch. London is full of tiny squares and mini parks, but if it’s raining, head for a nearby “visitor attraction.” The Tate Modern’s main hall has lots of steps to perch on; Somerset House’s entrance has some tables and chairs; and the sprawling Barbican center has sofas galore. Just remember, don’t spend too long hogging the seats and clean up your trash. Wherever groups from a far flung country have settled, good, cheap food can be found. So for dinner try these locations: Indian or Bangladeshi restaurants in Tower Hamlets, Portuguese food in the Oval, Lebanese around the Edgeware Rd, Turkish in Hackney and Haringey, or Vietnamese north of Shoreditch. Chinatown is the exception, but if you head away from the main tourist areas you will find cheaper Chinese canteens and Sushi cafés like Taro on Brewer Street which does Chicken Teriyaki Don (boxes of rice, bean sprouts and sticky chicken) for £5.90. Or keep your eyes out for Lamachun — a thin tasty Turkish “pizza” served rolled up and stuffed with salad — which goes for £2 at any good Turkish place. ££££ Tip: Find a BYO and bring your own cheap beer or wine. 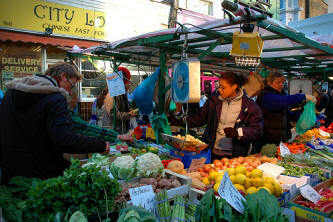 ££££ Tip: Start searching for somewhere to eat before you get hungry, the hunt is part of the fun of exploring London. The key to sticking to your budget is entertaining yourself for free during the day. Hey, this is London, so no problem there. The huge selection of free museums, galleries, churches, bridges and street entertainment could fill a month, let alone one weekend. If you splurge on a Time Out you can scour it for smaller one-off events and exhibitions. Many people come to London for the shopping, but on this budget that’s out of the question. If you have nerves of steel and a lock on your wallet, window shopping is great fun. London nightlife can be fun for the hard of spending too. Find a great “ye olde pub” and dole out your £11 on real ales and darts with the locals. Hunt down a local comedy venue, hand over most of your £11 to get in, then stick to lemonade. Find a club with a free night and dance the night away (93 Feet East in Brick Lane does Free Fridays once a month). Again, check out Time Out for listings. 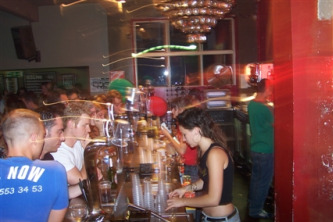 ££££ Tip: Ask around at your hostel, you might get invited to a house party, the cheapest of all entertainments. London and Londoners move at a frantic pace. Don’t join in. Relax and stroll about. Lots of people spend money on holiday to stave of boredom. When you’re traveling on a budget, go slow, look around and enjoy the buzz of one of the planet’s most exciting cities.